Google on Wednesday introduced a major overhaul to its familiar homepage. Now, in addition to offering search suggestions as you type, you'll actually see search results generated with each keystroke, too. With Google Instant, you’ll not only see suggestions as you type, but actual results as well. 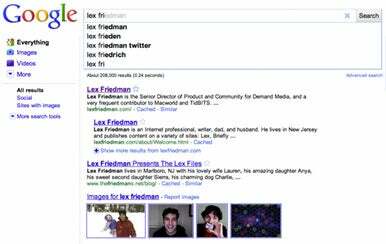 In early testing, I'd barely finished typing “Lex F” before a pageful of ego-boosting results appeared on my screen. Whether Google Instant offers enough to get me to stop using my browser’s built-in search bar, only time will tell. And thanks to Google Instant, I may suddenly have a lot more of said time. Google is rolling out the feature over time, warning that it may be “a couple of days” before the feature is available to every Google.com visitor.